Low-loss optical fibres have revolutionized the field of telecommunications. 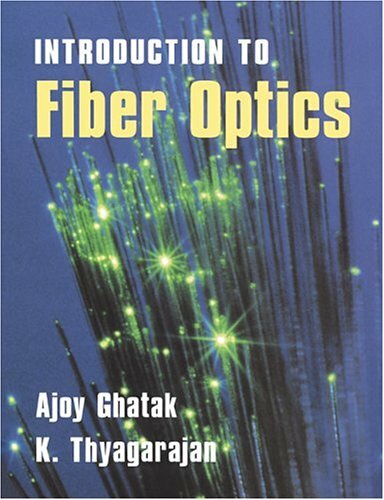 This book introduces the physical principles of optical fibres, and describes their use in sensor technology and modern optical communication systems. was a consultant to Tejas Networks India Pvt. Ltd., Bangalore and has held visiting positions in Thomson-CSF, France and University of Florida, Gainesville, USA.Ajoy Ghatak has recently retired as Professor of Physics from IIT Delhi. He obtained his MSc from Delhi University and PhD from Cornell University. His research areas are Fiber Optics and Quantum Mechanics. He has several books in these areas and some of them have been translated into foreign languages. The first edition of OPTICS has been translated into Chinese and Persian. Professor Ghatak is a recipient of several awards including the 2008 SPIE Educator Award in recognition of his unparalleled global contributions to the field of fiber optics research, and his tireless dedication to optics education worldwide and throughout the developing world in particular. He has also received the 2003 Optical Society of America Esther Hoffman Beller award in recognition of his outstanding contributions to optical science and engineering education. Furthermore, he is a recipient of the 1979 CSIR S S Bhatnagar award, the 1990 UGC Meghnad Saha award, the 2003 International Commission for Optics Galileo Galilei award and the 2007 Lifetime Achievement Award of the Optical Society of India.